The March Baltimore LSCC meeting featured a very special show-and-tell: a spectacular 1839 dime variety, having extremely heavy obverse die cracks, owned by Gerry Fortin and pictured in the November 2012 e-Gobrecht. The cracks meet in the central portion of the obverse and make the coin look like it has been carved up into three big slices of pie. 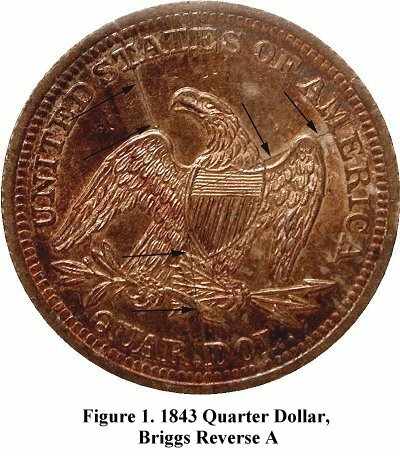 Seated quarter collectors have some similarly neat die varieties featuring significant cracks. Two of them happen to appear on reverses of the 1843 quarter. A crack pattern similar to the 1839 pie crack dime appears on the reverse of a relatively obscure die pair of 1843 quarter. The “shattered reverse”, pictured in Figure 1, is Briggs reverse A and is described but not pictured in the book. It appears to be quite rare with only a single example seen in more than 8 years of looking. 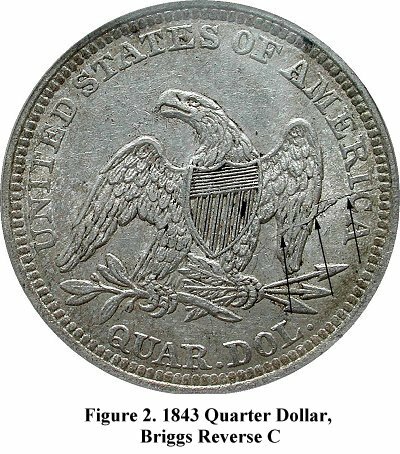 A better known and equally interesting variety of 1843 quarter is the so-called “lightning bolt” reverse pictured in Figure 2. The lightning bolt reverse is Briggs reverse C and is scarce, but not rare. The 1843 Philadelphia quarter is a common date for a seated quarter, but it’s always worth checking out your common date quarters to see if you have an uncommon and neat die crack variety.